This scheme of work is not in any way prescriptive, it is simply offered as a possible way in. It should be adapted and moulded to fit particular teachers, students and resources. The 2010 Controlled Test is 50% of the total marks for the GCSE. The Popular Press refers to mass circulation national newspapers, targeted at the popular end of the market including The Sun, The Daily Mirror, The Daily Express, The Daily Mail, The Daily Star, The News of the World, The People, The Daily Record, the Sunday Mail and their associated websites. 3571/FM). The pre-release date is Monday 26 April 2010. Week 1 What is the Popular Press? To understand what the popular press is and what it sets out to do and to apply that knowledge to at least 3 titles. The earliest known newspaper was the Roman Acta Diurna (The Daily Events), started around 59 B.C. This was a daily handwritten news report posted in a specified public place under the orders of Emperor Julius Caesar (100–44 B.C.) but not actually on paper. Around A.D. 700 the Chinese developed the world’s first printed newspaper, called the Dibao, which was produced with hand-carved wooden blocks. The world’s first modern newspaper is recognised by the World Association of Newspapers as The Relation published in Germany by Johann Carolus (1575 - 1634) The German Relation was published in Strasburg. 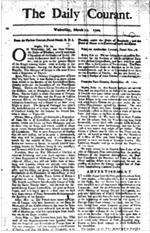 The first regular English daily newspaper was the Daily Courant, which was launched in the reign of Queen Anne in 1702 and looks like a difficult read compared to modern popular newspapers.